I’ve always loved fruit pies – berries, peaches, apples; pretty much any fruit mixed with a good helping of lemon juice and sugar tastes delicious to me baked in a flaky pie crust. Around the holidays I make pies more frequently but they are a lot of work and can’t get myself to do it in the summer! I read a book about an American in France recently and all things French (including their amazing foods) have been on my mind. 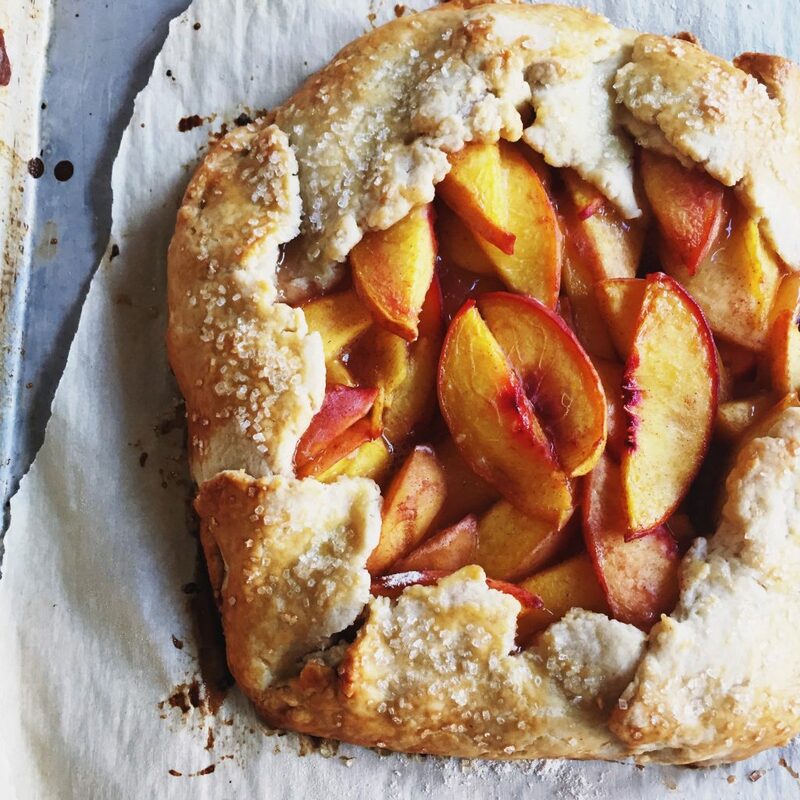 Enter this Homemade Peach Galette. My husband loves peaches. Loves them. Fresh, baked in treats, any way he can get them. When I planned out some treats for the week I thought I’d give the galette a try. 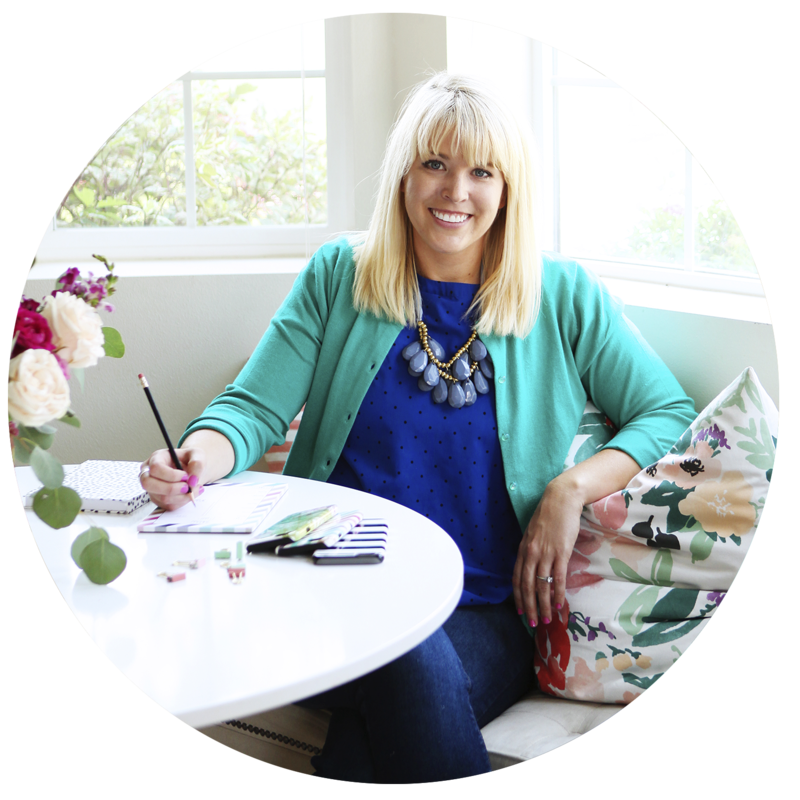 I’ve seen them all over but never made one – and now I’m questioning why. They are so much easier than pies (freeform! no pan! no second crust!) and look lovely. I love messy looking, non-perfect desserts. There’s a lot less pressure with a galette than with a pie to get it looking a certain way. I’m a big believer. 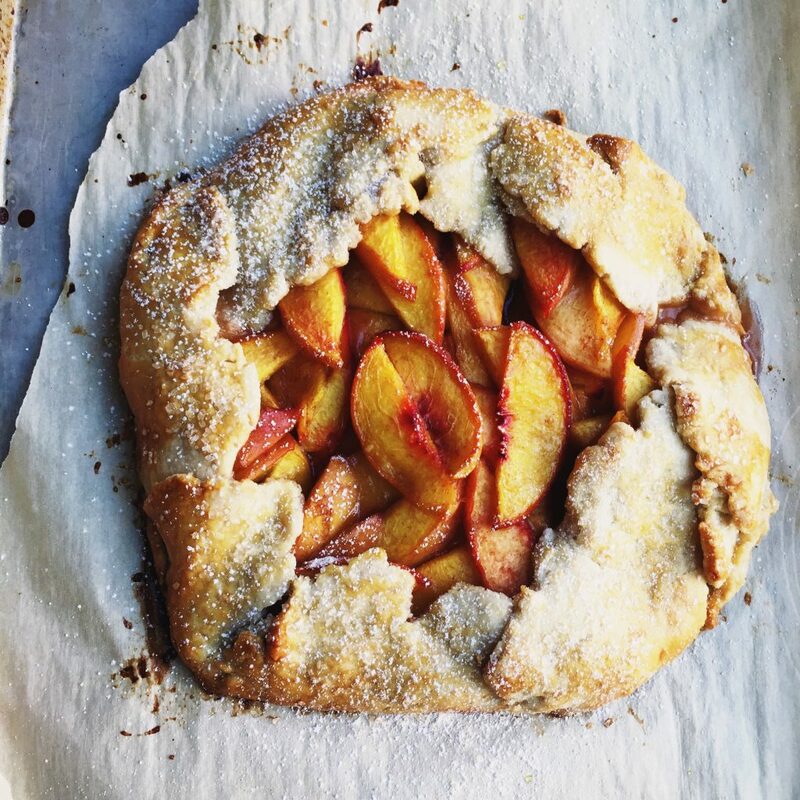 Looking up recipes for this Homemade Peach Galette was a bit frustrating – so many recipes called for store-bought crusts. Those are great in a pinch, but I think the star of the show for a galette really is the crust – a thick flaky crust. It’s really easy and I’m guessing you have the ingredients already on hand (flour, butter, salt, sugar), so give it a try! Plus, a freeform crust is pretty beautiful compared a perfect circle, right? 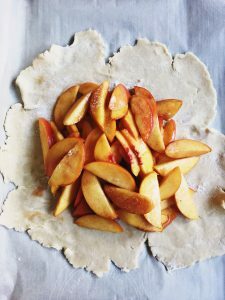 **Galette Tip** Make sure you follow the step in the recipe that includes dusting flour on the middle of the crust before you place the fruit down. This will prevent the bottom from becoming soggy! I’d read this years ago about galettes and was glad I remembered it here. Nice and firm crust throughout the bottom. 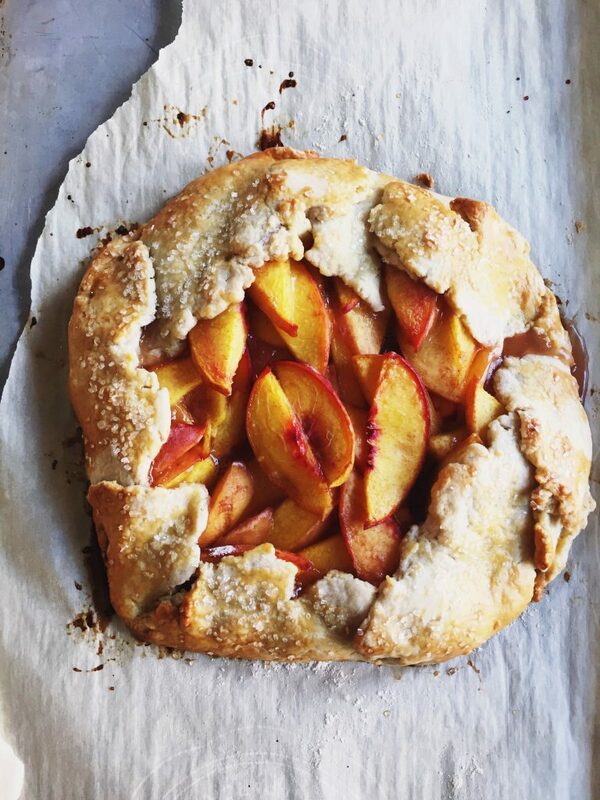 If you haven’t ever made a galette, this is a great time to start. You can pretty much throw some pie dough together, roll it out, shape it around your fruit and bam – a pretty, easy, and delicious treat. PIE CRUST - In a bowl, cut chilled butter into chilled flour. Create a crumbly mixture by breaking the butter and combining with flour. Once you have finer crumbles, begin adding iced water (a tablespoon or two at a time) and continue mixing until larger clumps are formed. Combine gently into dough ball. Turn out onto a floured surface and gently knead dough into a rough disc. Wrap in plastic and let chill for 30 minutes in fridge or 15 minutes in freezer. Preheat oven to 375F and line a baking sheet with parchment. FRUIT FILLING - Thinly slice peaches and place in a large bowl. Add sugar, cornstarch, cinnamon, and lemon juice. Mix well until combined. Roll out pie dough to large 11" round(ish) shape. Place dough on parchment lined baking sheet. 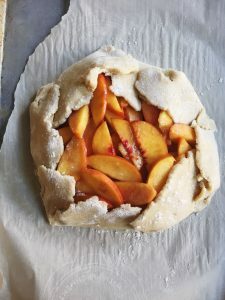 Before spooning peaches onto dough, be sure to sprinkle a layer of flour on your dough round in the center where the fruit will go. This will keep your dough from getting soggy in the middle bottom. Spoon peaches into center of dough, leaving a 2-3" border. Fold dough over and pinch to enclose peaches, leaving the center open. Brush crust with egg wash and sprinkle with coarse sugar. Bake for 35-45mins, until crust is golden and juices are bubbling. Cool on sheet for 10mins before serving. Optionally dust with powdered sugar once it's cooled. Store in fridge. Serve cold or reheated, on it's own or with ice cream or whipped cream. 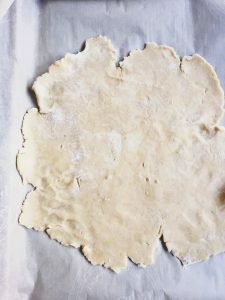 One thing I loved having on hand for this recipe was bakers grade parchment paper. I love this stuff. It comes in premade sheets that fit your baking sheet perfectly, it has a high temperature cook point, and makes transferring your galette off the pan a breeze (not to mention no clean up). Try some for yourself. I’m sure you’ll love it. See how easy it is to roughly fold this dough over the fruit? No precision needed. I also like how small this Homemade Peach Galette is – the slices ended up being a lot smaller than with a pie. 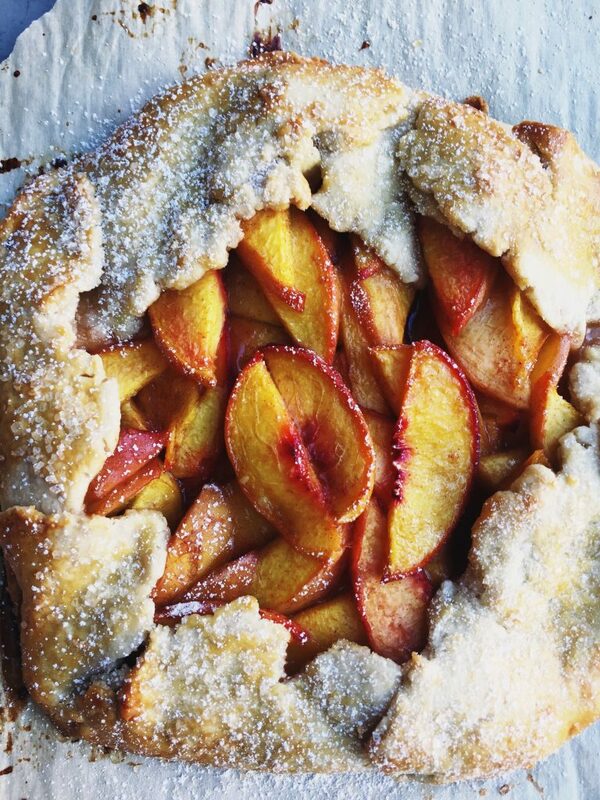 Be sure to add this Homemade Peach Galette to your menu plans for this weekend or next week. It’s such a simple and delicious treat. 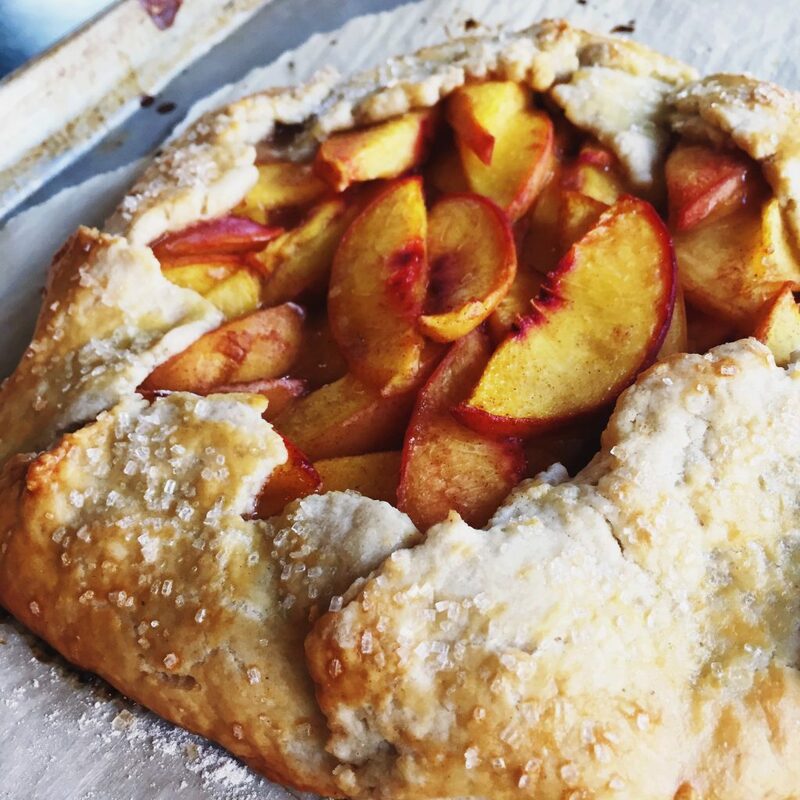 Let me know if you make this Homemade Peach Galette! If so, be sure to tag us @plumstreetprints / #plumstreetrecipes on Instagram or Facebook.